A fantastic recipe to add to your mid week meal rotation, a complete meal made in one pot, on the table in 15 minutes. A creamy, parmesan sauce (made without cream!) 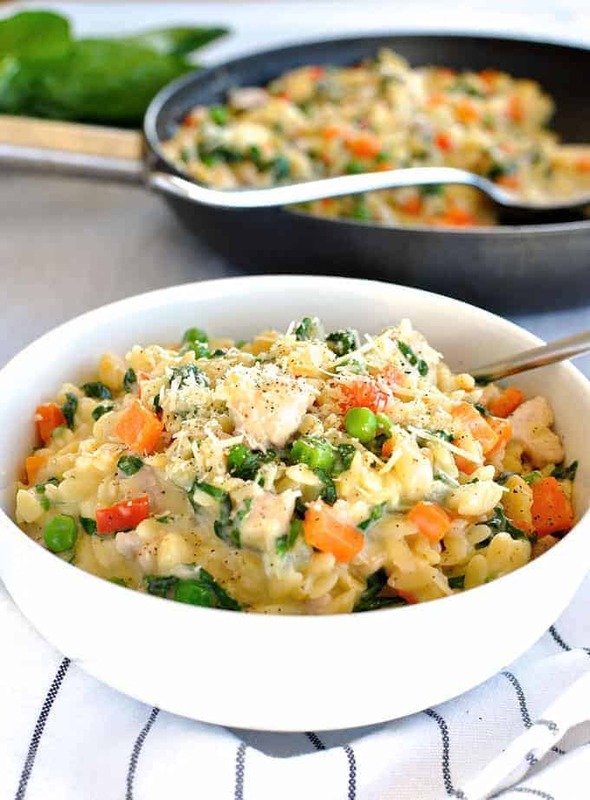 and with plenty of vegetables, this is just like risotto, except it won’t take you 45 minutes to make. The kids are sure to love this – as do the grown ups! I have to admit, I do not approve of the “one pot pasta” phenomenon. I tried it once and the plain fact is that if you cook the pasta in the same liquid that reduces down to become the sauce, it is going to be starchy. 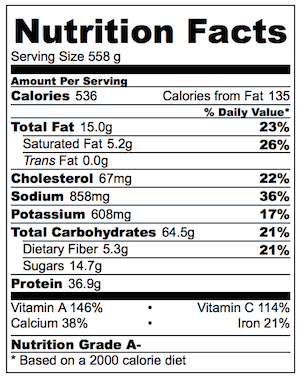 And for tomato based pastas, it’s just not very nice – the sauce is kind of sticky and gluggy which is just wrong. Or maybe I just used the wrong recipe (I’m not going to name my source….). But…..orzo (risoni) is another story. It cooks faster because they are smaller, and when made in a creamy based sauce (but with no cream! ), the starch actually acts as a thickening agent and it is as though it is supposed to be part of the sauce, rather than a compromise for the convenience of being a one pot meal. Orzo is a rice shaped pasta so this is practically a risotto, but it only takes 15 minutes to make instead of 45 minutes which is why, besides being so delicious, this is a regular for my mid-week meal rotation. This recipe has a lot of vegetables in it which makes it a complete one-pot meal. Feel free to change the vegetables up with whatever you have on hand. I love the creamy cheesiness of the sauce which is made without cream. This recipe makes enough for 3 normal size servings, or 2 very hungry people. Leftovers are perfect for making Muffin Tin Spaghetti Nests which kids absolutely adore. Orzo / Risoni Bolognaise – one pot bolognese pasta dish! 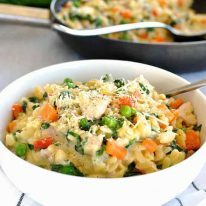 Creamy Salmon Risoni / Orzo (15 Minute Meal) – tastes like risotto, except MUCH faster to make! Baked Greek Chicken Orzo (Risoni) – Greek chicken AND orzo made in one pot! 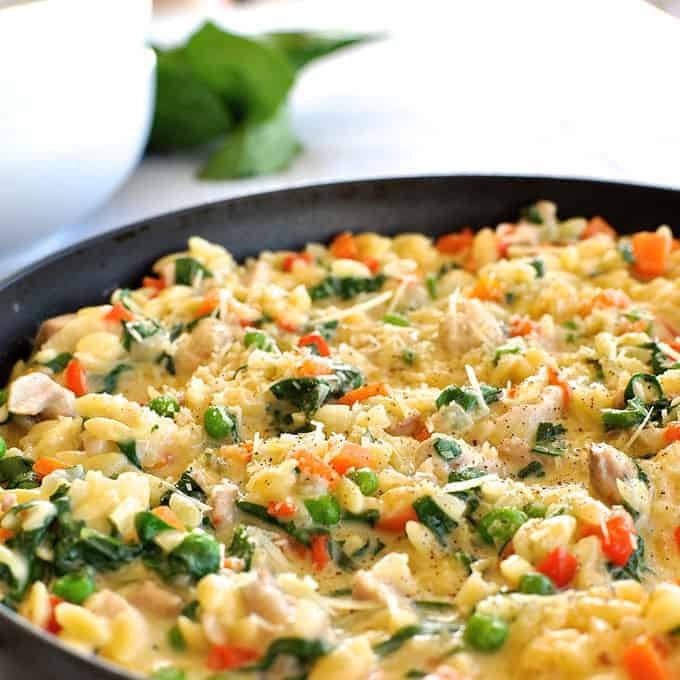 A complete meal in one pot, on the table in 15 minutes, orzo / risoni with chicken and loads of vegetables in a creamy parmesan garlic sauce (without cream!). Convenience without compromising taste! This is sure to become a regular in your mid week rotation. Place the oil and mince the garlic straight into a large non stick pan that has a lid. Make sure the pan is reasonably deep - around 5cm / 2.5" or more. Otherwise, use a large pot. Add the bell pepper (capsicum) and chicken and cook until the chicken is white all over (it should still be pink inside) - about 1 to 2 minutes. Add the milk, stock, orzo (risoni) and flour, put lid on then bring to boil, then turn down to medium. Cook at rapid simmer, stirring once or twice, for 5 minutes. Keep the boiled water nearby to add in case the liquid evaporates too quickly - this will depend on the size of pan you used, strength of heat you are using etc. If you are not using a non stick pan then you will need to stir more than one or twice, just to ensure it doesn't stick to the bottom. After 5 minutes there should still be a bit of liquid and the risoni should be soft on the outside but still firm on the inside. There needs to be enough liquid to cook for another couple of minutes - if you are concerned, add a bit more water (don't worry if you add a little too much, it will reduce quickly at the end). If you added too much water, leave it on the stove for another 30 seconds to a minute and keep stirring - it will cook out pretty quickly. 1. One of the reasons this can be made in 15 minutes is because the order in which you add the ingredients allows you to start cooking while you continue to chop. 2. Leftovers are perfect to make Muffin Tin Spaghetti Nests. I just made this – delicious! I’ve actually been following quite a few of your recipes. Do you think this will freeze well? Thanks! Had a chicken breast that needed cooking, so I gave this recipe a spin. Followed it to a T, but found my stock wasn’t doing it justice. So I added a large Knorr’s bouillon cube to the thickening liquid. Perfect. Sounds great! Sometimes the type of stock can have an impact on the dish, but I’m glad it worked for you! This was delicious and easy! I do agree with the others, total cooking time (after I prepped and chopped everything) took me 50 minutes total. Mine was also a bit too soupy. Looking forward to leftovers after the orzo soaks in all the flavors! Next time, I will try shrimp with asparagus!!! This was really good and tasty. I will definitely make it again. I feel though that the 15 minute prep time is overly optimistic. There is garlic and onion to chop. A carrot (s) to wash and peel, a red pepper to wash and chop, don’t forget to wash the spinach and chop it. Whoops, I forgot about the chicken that needs to be cut. None of these things are difficult in itself, but I just found that the time needed was more than 15 minutes. This is a meal that I would never make after work unless the prep work was done the morning before I left for work. Then it would be a snap to prepare. For me, this is a perfect recipe for a weekend meal. So, yes, this recipe is a keeper and I would recommend you make it, but keep in mind that it requires a bit of time and effort. Oh, btw, I did not need the boiling water either. I am going to try freezing the leftovers and I am betting that it will freeze well. Thank you for sharing the recipe. Fantastic recipe. Would you recommend trying it with beef? I think the notation of five mins preparation time is a bit on the slim side! Hello! I loove your recipes and am going to try some on weekend… can I ask what would you recommend in case I don’t have chicken broth? For this and other dishes? Can this keep well in the fridge or freezer as leftovers without making them into nests? Yep, it reheated nicely because it’s saucy! Thanks for another one pot dish. Not sure where I went wrong but I really Schruted it lol. I added the correct amount of liquid without the extra water and it took quite awhile to cook the liquids down. Either way it turned out tasty. Hope my littles like it!